Mid 1990s, I found this "castle" on Market Street. An elderly woman noticed me looking at it's plaque which read that the surrounding park like area was built for this landmark. She told me the story: "An eccentric landowner had built this as his own small "starterhome" in the 1930s. Being a Castle-lover, he purposely designed it in that fashion." The picture you have posted is a small tower built as a pumping station or metering station for Newarks water supply. I know the place like my own backyard because basically....it is. You are incorrect about the location though. It is on Bloomfield Ave ..... at the intersection of First Ave and 6th street. Where they all come together. 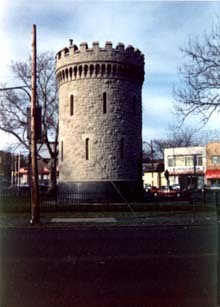 The Bloomfield Avenue tower is a memorial to Mayor Joseph E. Haynes and a former meter house for the Newark water supply. I'm picking up again on my castle research. I thought you might want to check out this website. It might allow you to update the unknown castle in Newark, NJ. I'll keep you posted on anything else I find. Picture courtesy of Robert W. Harney.